"The Vyborny Book" which is the basic document for the study of Vyborny ancestors refers to the family tradition regarding the person named Cernik. He was said to be the manager (the chief or the steward) of the yard belonging to the Jesuit College at Kutna Hora and his surname was changed to Vyborny. Except for the family tradition there is no known sound evidence. Therefore this tradition should be treated as a hypothesis. Are there any questions which would cast some doubt on this hypothesis? The tradition is based on the assumption the word "wegborneg" was of the exactly same semantics in 17th century as today (= excellent, perfect, etc.). It would be good to consult some specialist in the Old-Czech language whether there could exist any possible changes in the sense of this adjective. Origins of surnames by different nations in Central-Western Europe have some common or similar forms. Could we find some analogous cases in other languages for a new surname which was inspired by the exceptional abilities of a person? We could hardly meet Herr Ausgezeichnet in Germany, Monsieur Excellente in France, Mr.Excellent in Anglo-Saxon regions, etc. If such hypothetic origin in Bohemia has been the only case such phenomenon should be interpreted and understood. Not only abilities or traits of persons may have inspired the origin of their new created surnames. Even geographic localization, parable from an animal or vegetable kingdom, distortions of foreign names, etc. are known as inspirations for new surnames. Could we find any of such cases to be potentialy responsible for the origin of Vyborny surname? Experience from some Slavic languages (Russian, Polish) may indicate the sense of the adjective "vyborny" need not to be exactly the same in 17th century or in the Old Czech as today. E.g. the word "vyborny" in Russian means "chosen" or "elected". And vice versa the Czech adjective "vyborny" is translated into Russian as "otlichnyi", which perhaps could bear some sense as "differing from". Russian seems to be the only language where a similar surname ("Vybornov") does exist. The Russian journalist "Yurii Vybornov" was known by about 1980/1990 (if only this was not his pseudonym). Also George Vyborny of Greenwich, Connecticut, U.S.A. wrote to me his grandfather was a representative of the Czech company Laurin & Clement [car producer - the predecessor of the present SKODA Co.] in the Tsar-Russia [before the World War 1]. Could there exist some descendants still? - More Vybornys/Wybornys can be found using different people search services ( Lycos , WhoWhere, Yahoo, etc. ) or by e.g. International Phone Directories. Except of the CR they reside in Europe in: (1)Germany, (2)Poland, (3)Austria. Different spellings have to be taken into account (V/W) looking them for. - Such a way one finds also at least two Vybornys from Ukraine and one from Moscow. The similar surnames (Vybornov) can be found the same way, too. Mrs.Vybornaia residing in the U.S. came there from Southern Russia. - To explain possible origins of Vybornys in Russia, etc. one should not forget there existed emigration not only to the New World but to the East too (in 19th century, mainly) - e.g. the famous minority of "Volyn Czechs" the farmers having settled in Western Ukraine since 1860's, etc. - The issue of Wybornys in Poland has not been analyzed so far. It is well known some Wybornys have emigrated to Prussia/Silesia since about 1730 (e.g. due to religious problems during re-catholization in Bohemia). Some of their descendants could have moved to the territory of present Germany, but others could still live in Poland (their surname spelled using capital W). Web-People-Search engines applicable for the Polish region have not been known, unfortunately. The Polish directory lists 154 individuals of the surname Wyborny (and Wyborna = the female form), however. "Could the first CS astronaut Remek be descended from the family?" Similar surnames as "Vyborny" are not known in other European languages (except Hungarian and Russian). This could cast some doubt on the hypothetic general applicabilty of such mechanism of the origin of the surname. Vyborny name according to "Guelder-Rose?" Latin was the common language in Middle Ages. Its dictionary could be of interest, therefore. The Latin word "viburnum" denotes a shrub with round bunches of white flowers. This is one of typical shrubs in Mild Climate Zone in Europe. Its Czech name is "kalina". The surname Kalina is not rare in Czech. It is used in some local names too, in particular in Slovakia (Kalinovo, Kalinkovo, Kalna nad Hronom). Could there be some roots of the surname formation? May the flower of a guelder rose could have been used in somebody's seal? The second grammatical case ("genitivum") of the latin word would be "de Viburni" ("z kaliny" in Czech) - could this symbolize the name which a person came from? We have not found any other similar name from the animal or vegetable kingdoms (except of the one described in previous paragraph). "Could Vyborny have come from the "Viborny" village?" Vyborny mill (denoted by a red circle), Lipa and Smolovy near Havlickuv Brod. 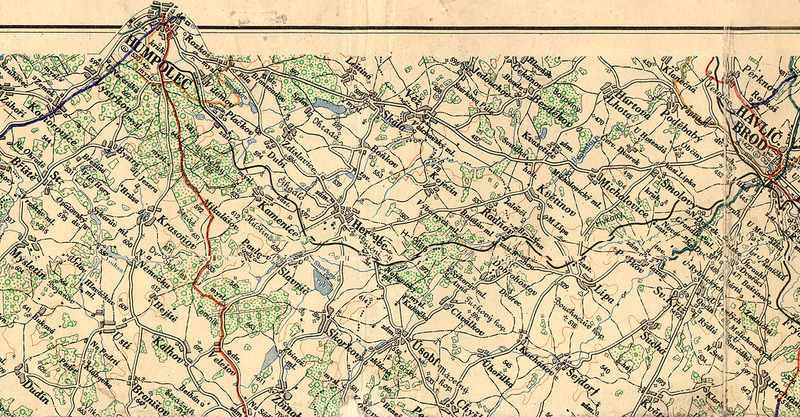 Greater formats of the map available clicking on the picture or even here. 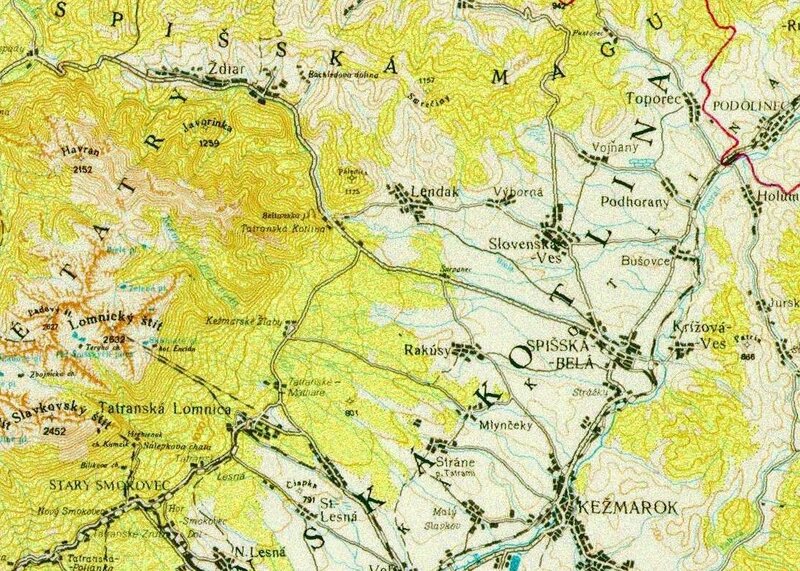 the only geographic name (on the territory of the former Czechoslovakia - with one important exclusion of the village of Weyborna located at Tremosnice near Caslav in 16th century) similar to the family surname is the "Vyborna" village under the Tatra mountains, Slovakia. Since the names coincide(see below), it would be of interest to present here some basic data and to describe briefly the origin of the name. The earliest record of the Vyborna village is from 1289. The name (of German origin) was Birburn. The village is situated in northwestern part of the Poprad hollows on the southern slopes of Spisska Magura mountains, elevation 706 meters (which concerns to the center of the village; the whole area of the village some 2100 acres is of the elevation from 629 to 1157 m). 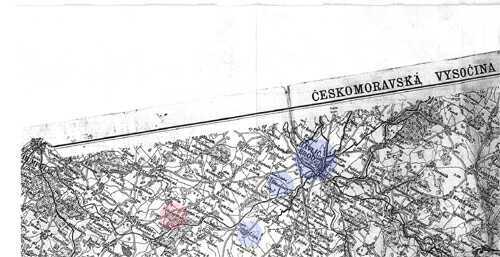 The evolution of the name later: Bybur and Byrbron (1290), Berbarn (1344), Byrewbron (1455) and Viborna since 1463, Sorkut in Hungarian, Bierbrunn in German and finally Vyborna after the establishment of Czechoslovakia in 1918. It belonged earlier to Spis district, after 1918 to Kezmarok district, since 1960 to Poprad district and to Kezmarok district at present again. It was a purely agricultural village belonging to lord families of Berzeviczy, Wakrotsch, Lasky, Horvath-Stanczits. 1869=528, 1890=538, 1890=467, 1900=481, 1910=454, 1921=436, 1930=427, 1940=443, 1948=525, 1961=477, 1970=522, 2000=776. After the World War 2 a great part of the former German population has been moved from the village and refugees from Eastern Slovakia came there. They worked either in an agricultural cooperative there or in other villages and or towns (Lendak, Slovenska Ves, Spisska Bela, Kezmarok). Position of the Vyborna village (northern from the town of Kezmarok). Click on the map to see details there. Two churches are in Vyborna. Roman Catholic from the 14th century (reconstructed in 16th and 17th century) interesting because its wooden painted ceiling. The evangelic (protestant) church was built in 1833. Those data are given in "The dictionary of national history", issued by the Institute of Encyclopaedies, Slovak Acad.Sci., Bratislava (1977-78). - apparently there is combined the German name Bier (and Hungarian name Sor) together with the German Born or der Brunnen (Hungarian Kut) which means a source or a well. German colonists probably brewed bier there. The initial German name Bierborn has been transformed (and deformed) into Slavic as "Viborna". So this is a clear formal coincidence of the names only, the most probably. - though, in fact, could a hypothetic person having travelled from this locality to West be called "of Viborna" ("z Viborny" in Czech)? There existed contacts between these regions and Bohemia even in 15th century, e.g. resulting from introducing of rests of "Hussite" army troops called "Bratrici" (after the battle near Lipany in 1434). Back to the page "Unanswered Questions"